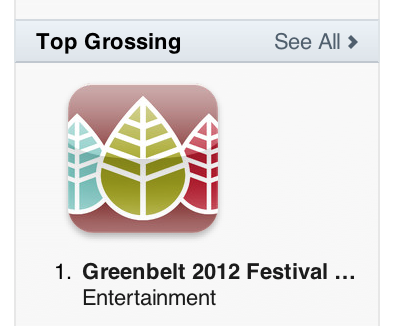 Today the Greenbelt 2012 Festival Guide was the top-grossing Entertainment app in the iTunes UK App Store. It broke into the top 50 most popular apps on the store. Every day the software I write at work is used by millions of people, but right now I'm more proud of this little app being used by a few hundred. Posted by pab at 21:41 | Comments will be back one day. Please email me instead!